“This has the potential to be life changing for these young people,” said Sheli Porter, director of high school curriculum and instruction for Chesapeake Public Schools. “We’re trying to expand the knowledge in our community that there are opportunities. You can make a good living and we have employers who are right here eager to talk to these young people." 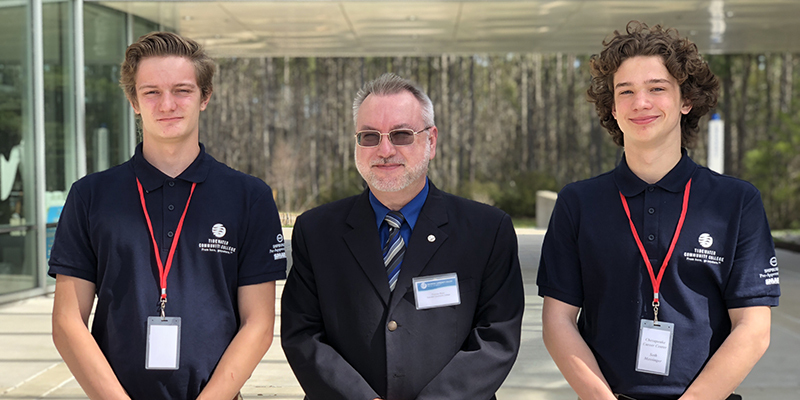 Pre-apprentice students Shane Phelps (Grassfield High) and Seth Messinger (Great Bridge High) with Thomas Stout, dean of science, technology, engineering and math on the Chesapeake Campus. 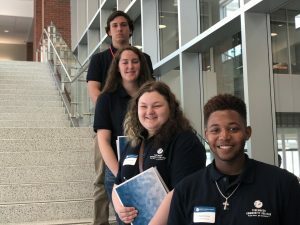 Juniors and seniors from the four major school systems, representatives from regional ship repair companies and administrators invested in Tidewater Community College’s Apprenticeship Institute created a buzz in the Chesapeake Campus Student Center. Mock interviews, resume advice and real talk from a panel of apprentices were all part of TCC’s first-ever Shipbuilding Pre-Apprenticeship Career Preparation Seminar. “This is collaboration — employers, high school students and the college all connecting,” said Todd Estes, director of TCC’s Apprenticeship Institute. The 132 pre-apprentices, each wearing navy, collared polo shirts, sponsored by The SMART Center, sat across the table from employers, all members of Virginia Ship Repair Association, for a sampling of some real-world questions they might be asked should they continue the apprenticeship route. Representatives from Newport News Shipbuilding, Oceaneering, BAE Systems, Lyon Shipyard, Tecnico and Colonna’s were among those in attendance. Interviews were conducted in the same manner as speed dating. When the pre-apprentices would stammer, freeze and even “pass” on a question, they were encouraged to dig deeper. “You’ve got to learn to think on your feet,” urged Will Early from Tecnico. As pre-apprentices, the students already have a leg up on achieving a Registered Apprenticeship opportunity that would allow them to “earn while they learn.” Three hours of real-world career preparation only enhances their chances of being part of a program that combines on-the-job training with a theoretical approach and a paycheck in career areas that have been identified as high demand. 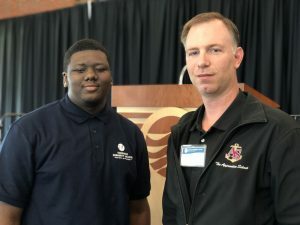 Demetrius Lee, a senior at Norcom High who was accepted into the Apprentice School just two days prior, enjoyed the practical tips he learned over three hours. Demetrius Lee with Will Prescott, training manager at The Apprentice School. Seth Messinger, a Great Bridge High junior, also found the day helpful. “Getting to know the companies and what they expect is great, so when I come back next year as a senior, I already have that relationship,” he said. Administrators from the school systems in Chesapeake, Norfolk, Portsmouth and Virginia Beach agreed that pre-apprenticeships are becoming an easier sell in an era of student loan debt coupled with the frustration of finding a good job even with a bachelor’s degree in hand. “This has the potential to be life changing for these young people,” said Sheli Porter, director of high school curriculum and instruction for Chesapeake Public Schools. “We’re trying to expand the knowledge in our community that there are opportunities. You can make a good living and we have employers who are right here eager to talk to these young people. For information about the Apprenticeship Institute, contact Estes at mestes@tcc.edu.